One item missing from the older Rialta is an outside "porch light". Beginning with model year 2001, Winnebago included one as standard equipment. 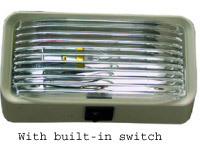 There are many different models of 3rd party porch lights available so check with your local RV dealer or check my list of on-line RV Parts dealers. The most popular types are 12V DC operated so that they can be attached to existing 12V wires in the Rialta. The most popular type includes a switch located directly on the light fixture but some ingenious people have managed to install switchless ones that are wired to the inside step light so that when that switch for that light is turned on, the exterior porch light is also on. These lights are relatively cheap, sometimes selling for less than $10 but the average is around $25. The wiring hook-up will probably require drilling one or more holes in the body of the Rialta so such an accessory becomes a permanent installation. If you do drill any mounting holes in the exterior side wall, make sure to use a silicone sealant around the hole where the wires come out and also around any attaching screw holes. Several people with newer Rialtas that came with the factory installed porch light have experienced short life of the bulb. See the page entitled "Bulbs and Fuses" for some possible alternative bulbs with a longer life.